I’d like to share 3 new habits that have been working for me in 2018. I’ll preface my unveiling by admitting that these habits aren’t earth-shattering. In fact, they are quite simple in application. Yet, if practiced consistently, you’ll enjoy some incredible benefits, i.e., enabling more peace of mind, better focus, and improved productivity. 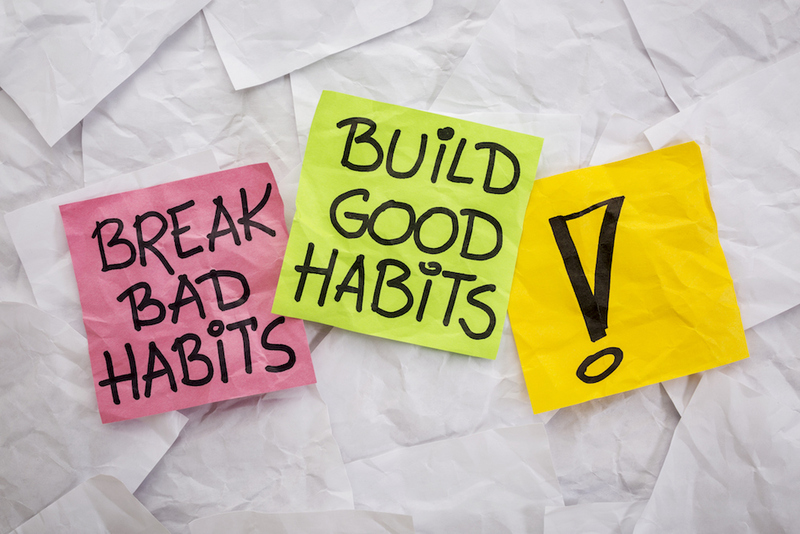 What’s more, you’ll have better practice building the good habits that set you up for success. This one was tough. I travel a ton for work, and spend a lot of time eating by myself. You can imagine, then, that it’s incredibly tempting to whip out my phone and scroll through the endless loops of Instagram, email, ESPN, Facebook, and LinkedIn. The next meal it’s the same thing all over again. The worst part is, it’s unbelievable the number of times I’ll do this without even noticing. But I finally did notice. And I recognized this incessant phone use as a bad habit. So, inspired by entrepreneur and CEO Aubrey Marcus, my phone now goes into airplane mode anytime I sit down to eat. This not only gives my screen-weary eyes a break, but it also gives me the space to enjoy my meal and be present in the moment. It’s truly amazing the reflection and gratitude I can engage in while enjoying a quiet meal without digital distractions. Plus, taking a break from the phone charges my mental batteries so that when the meal is over, I’m ready to hit the next task of the day with full focus and energy. Craig often talks about the importance of doing a brain dump each night during the week. I’d like to tack on to that with a unique “grading” tool that puts the pressure on to achieve daily. When you start the next day, you know exactly what needs to be done. If these three tasks are completed, no matter what else happens, you get a “pass” and can quote the beloved Ice Cube: “Today was a good day.” The goal, of course, is to have as many “pass” days as possible. The real benefit to this one is the momentum you start to build after a handful of “pass” days. I’ve found myself staying up late to complete a task I otherwise would have pushed to the next day, just to keep the “pass day” streak alive. Don’t get me wrong. I have plenty of “fail” days, but there’s benefit to these, too; they give me a jolt of motivation to make the next day better. “Visualization” is about as overused as “mindfulness” and “mediation.” Yet, I never thought to apply the practice to sales meetings, which are the lifeblood of my craft. Now, I spend 10 to 15 minutes visualizing every detail of a meeting on the day it’s scheduled. I picture everything—from the moment I walk into the lobby, to the sound of my shoes on the floor, to the introduction of our team, to kicking off the agenda, to walking out of the building. I’ll do this three or four times for a big meeting. The benefits are incredible. I’ve never felt more calm and prepared for a meeting—and all it took was 3 simple 10-minutes visualization exercises. It makes sense, of course; I’m so calm because I’ve literally practiced the meeting in my head for a good half-hour before it even starts. The best part: This habit can be applied to any activity that you deem important. Spend time with your thoughts, and vividly imagine every step of the activity of importance. I guarantee it will not only put you at ease, but it will actually help you “rehearse” without needing to go through the motions. What new habits are you employing in 2018 to take your life to the next level? Share them in the comments below!